PHIL STAMBAUGH: Defending champion in the 3M Greats of Golf Challenge, a comment from each of you about being here. Gary, you want to start us? GARY PLAYER: Well first of all, it’s nice to be back here. It’s a wonderful event, and Insperity, one of the best sponsors on the Tour. Delighted to play with Arnold and Jack as depending champions. A tough job this year, a couple young guys, Johnny Miller, hits the ball a long way, we are looking forward to playing. It’s been very exciting because a lot of people come up to us and say, well, we never thought you would play again together. We might be doing it for another ten years. JACK NICKLAUS: Speak for yourself. (Laughter). PHIL STAMBAUGH: Jack, you want to comment about coming back to Houston for this. JACK NICKLAUS: Yeah, last year was something unusual for me, because I don’t play any golf anymore. They came back here and I think we all had a great time playing together. We had fun. We won, which is probably secondary to having fun at our age, and it went well, sometimes. If we can remember the next day we won, that’s part of the problem. We were treated very nicely and everybody seemed to enjoy having us here, and we are back again. I won’t say what I did last year when I went home. It was kind of fun. But anyway, we had a good time and we’re looking forward to it. ARNOLD PALMER: I’m hitting it so far, I hear it land. Well, I’m looking forward to it. Just I’ll watch Gary and Jack play and it will be fun. It will be like old times, and of course I watched them in the Legends of Golf in Savannah last week, I took note of that. But it’s fun to be here, and I’m watching, because you never know when it’s going to be the last time. Q. Obviously The Open this year is back at Muirfield and you have experience at Muirfield. Can you just talk about the type of player you think will succeed, knowing what the skill set needed to succeed at Muirfield is; the type of player out there now that you think will succeed? JACK NICKLAUS: The same one that’s always succeeded: The guy who plays well, hits it straight and putts like the devil. JACK NICKLAUS: I think Muirfield is a golf course of patience and I think it’s a golf course that the guys have got to, when I won there, and Gary won there, also, I think you needed to keep the ball in play and I used 17 drivers and 17 almost cost me the tournament, I drove it in the bunker and got myself in trouble leaving my game plan in the last round. That was the worst rough I’ve ever seen in a golf tournament, that high, right off the edge of the fairway. I said, you know, you didn’t dare stick your bag down hunting for a golf ball because you would lose the bag and if you had a short caddie, you would lose him, too. (Laughter). That’s sort of where we were. Q. This summer is the 50th anniversary of the 1963 PGA Championship; wonder what you might remember from that week, like 113 degrees all week. JACK NICKLAUS: It was hot, couldn’t pick up the trophy afterwards without a towel, because it cooked your breakfast on the trophy. We had just come from Lytham where I felt like I gave away the tournament bogeying the last two holes and losing by a shot; obviously did. But came from 50‑degree temperature to 100‑degree temperature, and make that adjustment, I was very proud to be able to do so. We had a lot of thunderstorms that week, and the course was wet. Played long. The No. 1 thing from that week, which I still have‑‑ can you imagine in, carrying something from that week‑‑ (laughter)‑‑ that was the money clip, thank you very much. That’s the money clip I won as the prize for winning the driving contest that week. I carried that for probably now 50 years, how about that for not losing a money clip, 50 years. Q. What are your thoughts on how important it is to, you guys get together for the Par3 Contest in Augusta but fans here don’t get to see you together like this. Giving back to the game, that’s what a lot of this is about. I know you know it’s important, and I wonder if you can put that into words, if you would. JACK NICKLAUS: He’s looking at you. ARNOLD PALMER: I didn’t hear the question. (Laughter). Q. How important it is to give back to the game and folks seeing you guys together, it means a lot to golf fans. ARNOLD PALMER: Well, I think it’s fun. It’s fun for us as well as the fans. I enjoy being‑‑ it is getting close to when I won’t be playing. I’m hardly playing golf anymore at all. So a few last times are going to be fun, and we’ll have some fun today. You know, who knows, we might even hole a wedge or something. JACK NICKLAUS: We are going to need to hole a few wedges. I think Gary was right. This kind of game that we are playing today, Miller will be 40, 50 yards longer than anybody else that’s playing. Johnny still hits the ball a long way. So that will be a big advantage. 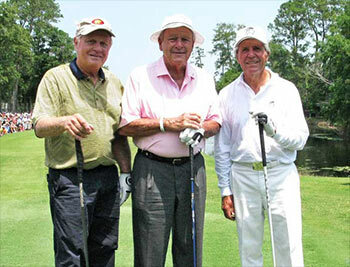 But getting Arnold, Gary and I together to play, we do it at the Par 3 at Augusta and we do it here. I think that’s the only time we’ve done it‑‑ we haven’t done it any other time in a while, have we. You’re right, it’s how many more times will we play together; we don’t know, but we always have fun playing together. Last year we had a blast, and that is definitely why I’m back here this year. We didn’t have a good time last year, we wouldn’t bother to be back this year. So it was fun and we’re looking forward to it. These guys, I’ve had the privilege to play with these two guys for a long time, and we have always had a lot of fun. We’ve always had a lot of competition. We’ve always tried to beat each other’s brains out when we played together and we root like hell for each other. GARY PLAYER: One of the things we did, we travelled the world extensively, the three of us and we didn’t get these enormous sums of money guys are getting together. We travelled the world because we loved the game and wanted to promote the game and here we are still. Last year I was quite amazed to see how many young people are still coming for our autographs and golf is having it’s problems now with numbers of rounds and professional golf has never been so healthy but rounds are down. That’s why it’s encouraging to see a guy 14 years of age play so well at Augusta, because a billion young people saw him play and it’s going to increase rounds of golf. By us still playing together, if we can help golf, more people to be playing, we’re happy. PHIL STAMBAUGH: I’m going to let you go warm up now. Thanks for coming in.